A very hardy and unique small shrub, blue honeysuckle, or Lonicera caerulea, is a species of Honeysuckle with sweet and tasty fruit. 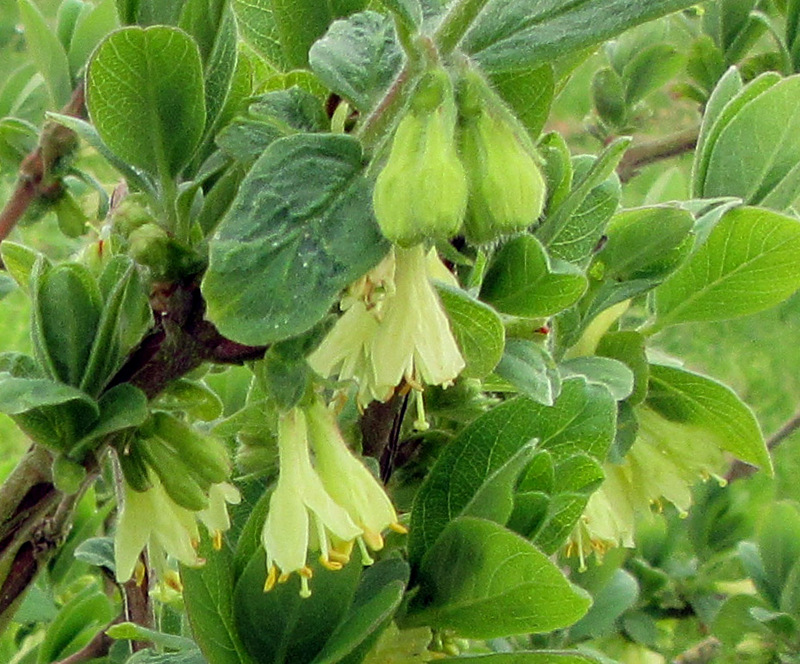 It is known by many other names such as haskap, honeyberry, sweet berry honeysuckle and swamp fly honeysuckle. This edible and very hardy species is native to Eastern Siberia, the Russian Far East, and Northern Japan, where, from ancient times, the native people have gathered and consumed the fruit in large quantities. 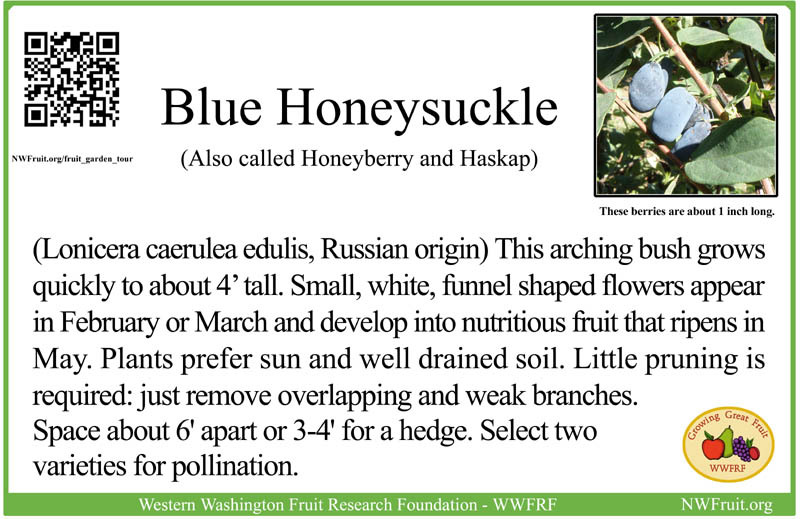 Blue Honeysuckle is valued for its tasty blueberry-like fruit, its extremely early ripening, often two weeks before strawberries, and for its exceptional hardiness, to minus 40° F. or below. Great for fresh eating, Blue Honeysuckle also makes delicious preserves. 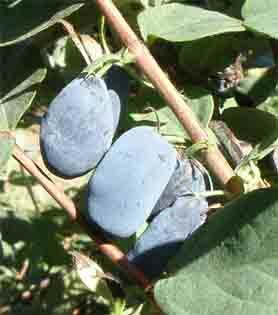 Pick when the inner flesh is purplish, not green – the fruit turns blue on the outside before it is ripe. The blooms are attractive but difficult to see from a distance. While it can be grown throughout the US, some varieties have proven better adapted to our maritime Northwest growing conditions. The late blooming varieties found in our Fruit Garden, Blue Velvet™, Blue Moon™, Blue Forest™, and Blue Pacific™ set and ripen significantly more fruit in our region. The other varieties grow well but bloom earlier, after our short and mild winters, and generally set less fruit because of the lack of bees and other insects available for pollination. Blue Honeysuckle come in many shapes! Blue Honeysuckle does well with compost for fertilizer and is adapted to a wide range of PH. 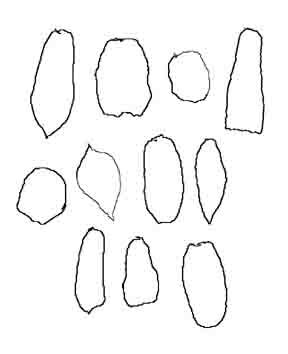 Plant at least two varieties for pollination. Plants do best with regular watering during the dry summers of the Pacific Northwest. Large, deep green foliage, compact, spreading form, and large, dark blue, tasty fruit distinguish this attractive and productive variety. 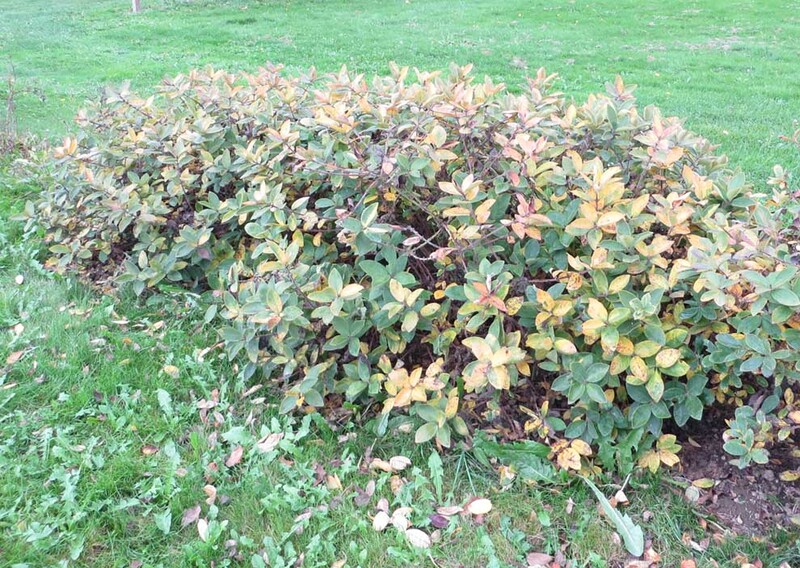 A very attractive, compact and spreading shrub. Blue Moon™ features soft, dark green, velvety foliage and bears good crops of large, tasty, dark blue fruit. From the Russian Far East, this special variety is prized for its attractive spreading form, light green foliage, and good crops of large, dark blue, tasty berries.